The Las Vegas lifestyle does not lend itself easily to a 5am wake-up call. Getting to bed at 5am is more the plan. 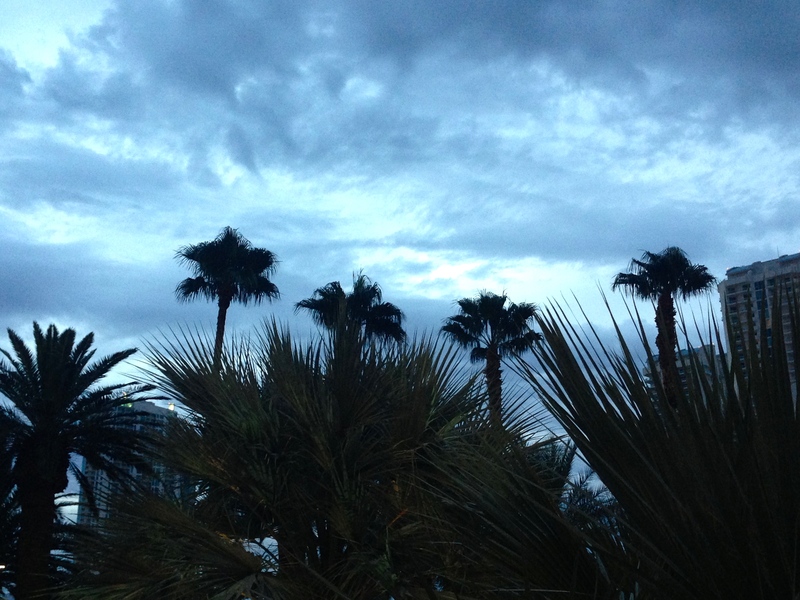 Yet we find ourselves standing under a palm tree well before six in the morning waiting for our tour bus. Orlando is reeled in by an extraordinarily chatty young woman in red tracksuit pants who manages to reveal quite a bit about her life before we are saved. By seven we have bright orange tour wristbands on, sausage and egg muffins in hand and a large coffee on the go as we settle into our chariot for the day. Richard Gere is the name of our driver (he says). He is shorter and a lot more Pacific-Islander-looking than he appears in the movies. 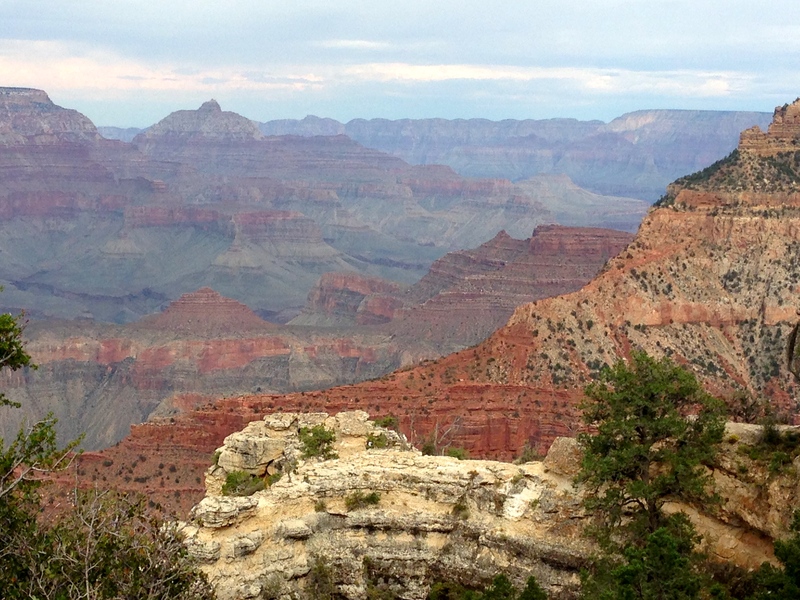 We are headed for the south rim of the Grand Canyon, to the heart of the Grand Canyon National Park. 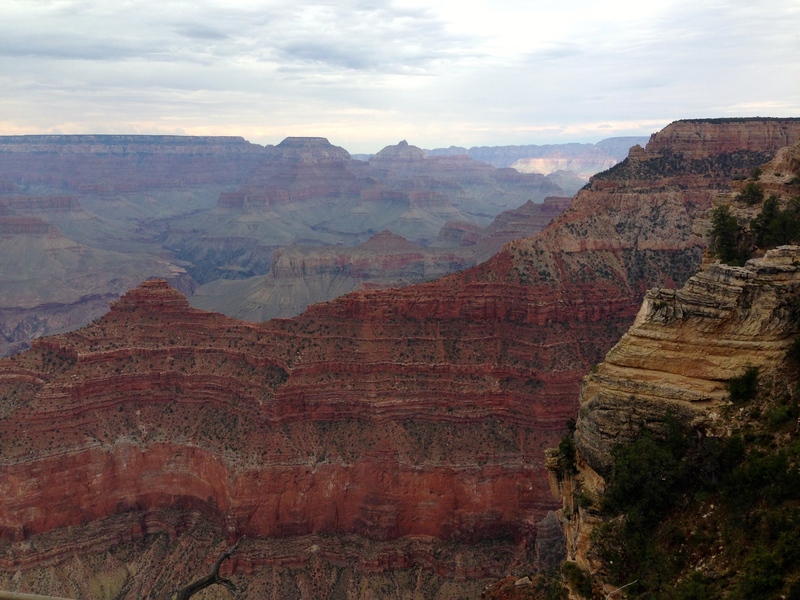 It is five hours there and five hours back, but my research tells me it’s by far the best view of the Grand Canyon compared to the so-called “west rim” which is an attraction manufactured by the local Hualapai tribe to offer a shorter day trip for Vegas tourists. The Grand Canyon itself is about 277 miles long; the “west rim” attraction (including the heavily-advertised Skywalk) is at mile 260. 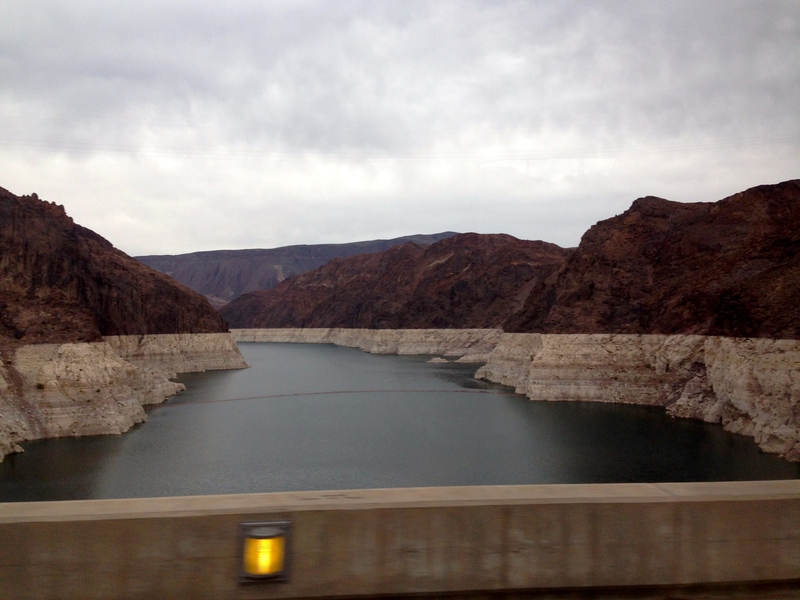 We drive out of Vegas past the homes of the rich and famous; our driver points out the homes of Barbra Streisand, Tom Selleck and others on the outskirts of a Boulder City as we head for our first stop at the Hoover Dam. It’s a brief stop and the engineer in me wishes I’d driven up here myself; sure, we get a pretty good photo opportunity, but we stop nowhere close to the dam itself and I would have liked to walk it and take it in a little more slowly. But I’m happy with the viewpoint and we drive on. 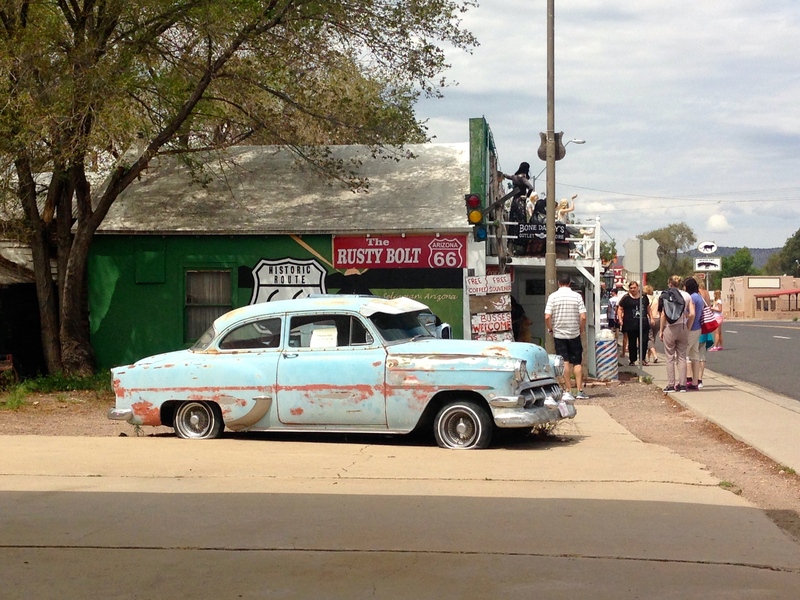 A couple of hours later we have another break in Seligman, a small rundown village on a section of the now decommissioned Route 66. 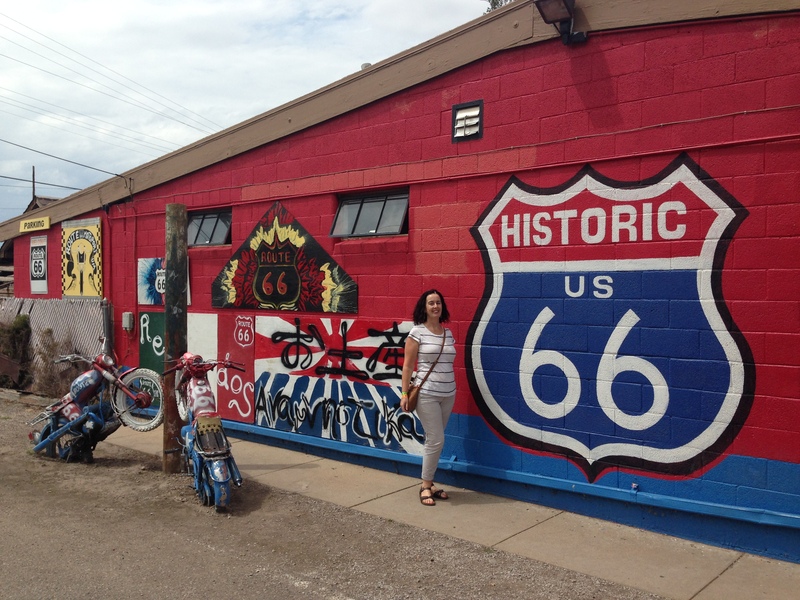 A few friendly cafés and gift shops are cashing in on the Route 66 obsession, with all kinds of memorabilia, tee shirts, fridge magnets and so on, sweetened by the offer of free coffee and restrooms. It’s kitsch but doesn’t take itself too seriously, and all the shops proudly advertise that they sell only products made in the USA. I like it. Back on the bus we settle down to watch a movie as the landscape continues to change. 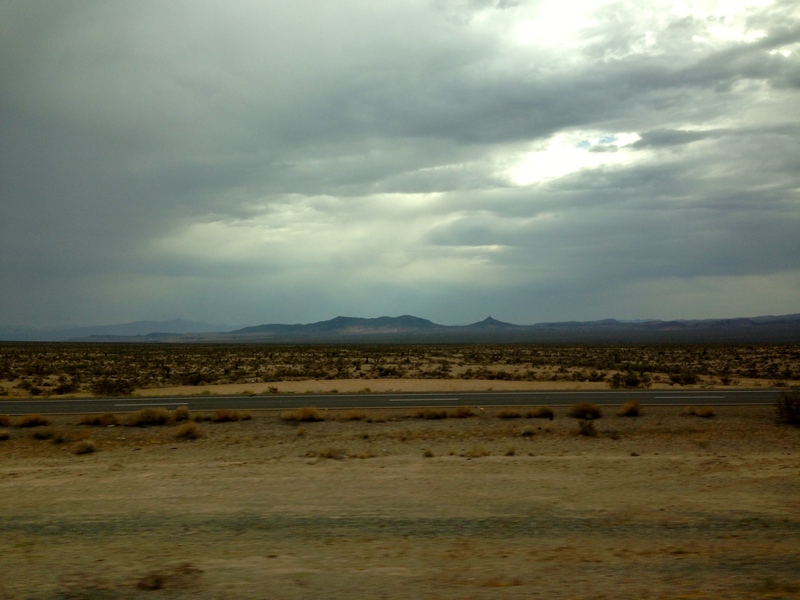 We are deep in the Mojave Desert here, with endless miles of rocky treeless hills. It’s beautiful. 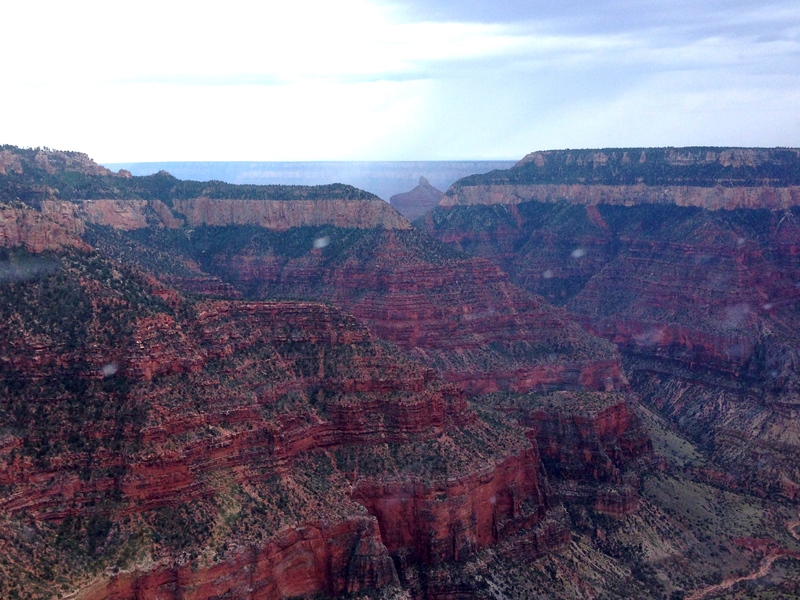 Close to noon we see a thunder storm in the distance; the driver tells us that is the beginning of the Grand Canyon. 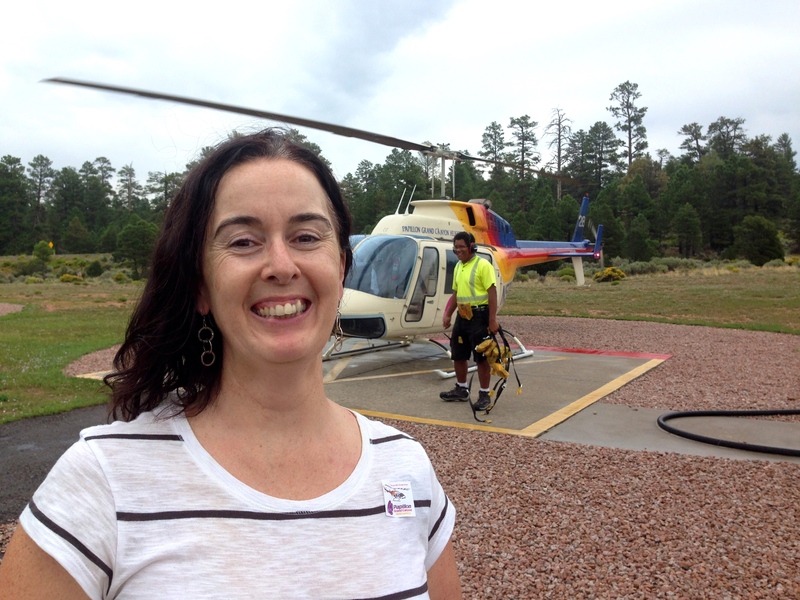 Five long hours after leaving Vegas, a handful of us are deposited at the Grand Canyon airport for our helicopter flight. I’d always promised myself that if I made it to this part of the world I’d do it properly, so we forked out the extra US$200 a head for the aerial view. At check-in we are weighed and our small daybags are taken and locked away: we’re allowed nothing on board except a camera. Flotation devices are strapped to our waists (what are the chances??) and we are led through a safety briefing video by the charming JR, an elderly tribesman with a twinkle in his eye who clearly loves his job. Minutes later we are standing by a tiny helicopter and I remember with alarm that I have a touch of vertigo. Heights I am pretty ok with; descending from any height, including a steep flight of stairs at a train station, I get very nervous. Was this really a good idea? My nerves are confused by the honour/horror of being shown to the front seat by the pilot; Orlando goes in the back with three others. The floor of the cockpit under my footrest is glass. I’m going to have to do this. 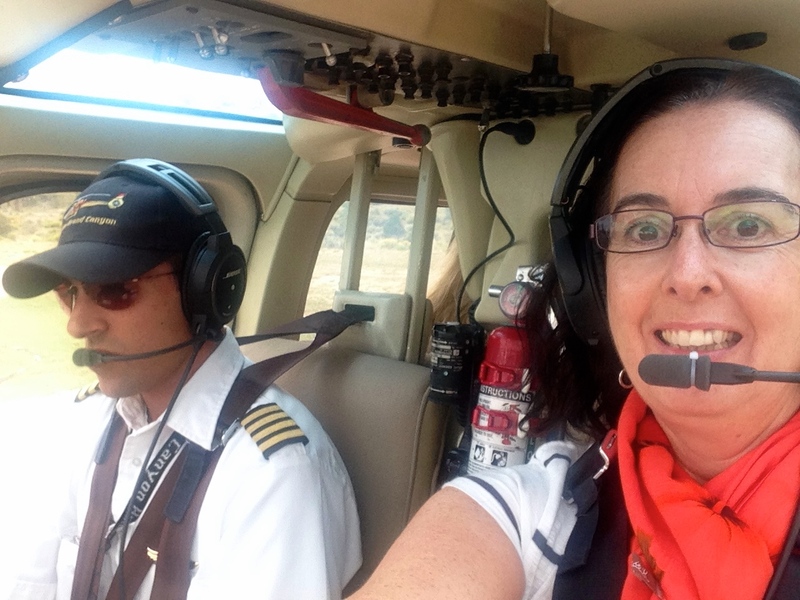 Tony, our pilot, welcomes us on board and we take off gently above the ponderosa forest. I’m doing ok so far. Soft rain begins to fall as “Riders on the Storm” plays through our headsets. Three or four minutes along we are cruising above the trees and I’m getting the hang of this heights thing. Tony points east and the music changes for the big reveal: the theme from 2001 A Space Odyssey plays as we approach the southern rim of the canyon. No words can describe the next few moments as the enormity and majesty of the canyon is revealed through dappled sunlight and misty rain. The music is exactly appropriate. It’s an extraordinarily emotional moment for me, and tears well up in my eyes. Spectacular. For twenty minutes we do a clockwise circuit across to the north rim and back, towards Dragon Head and then back past Isis Temple and Hermit Rapids. 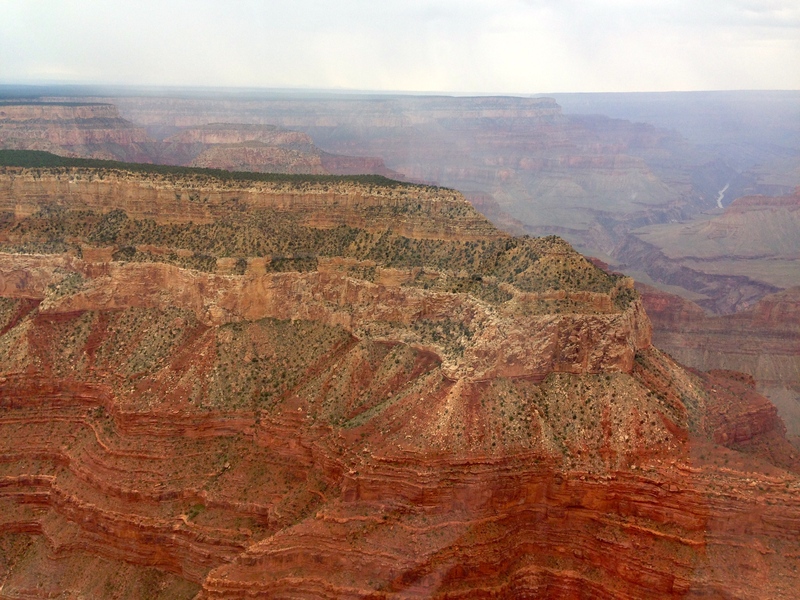 The North rim is about a thousand feet higher than the south rim, and the difference in vegetation is marked. 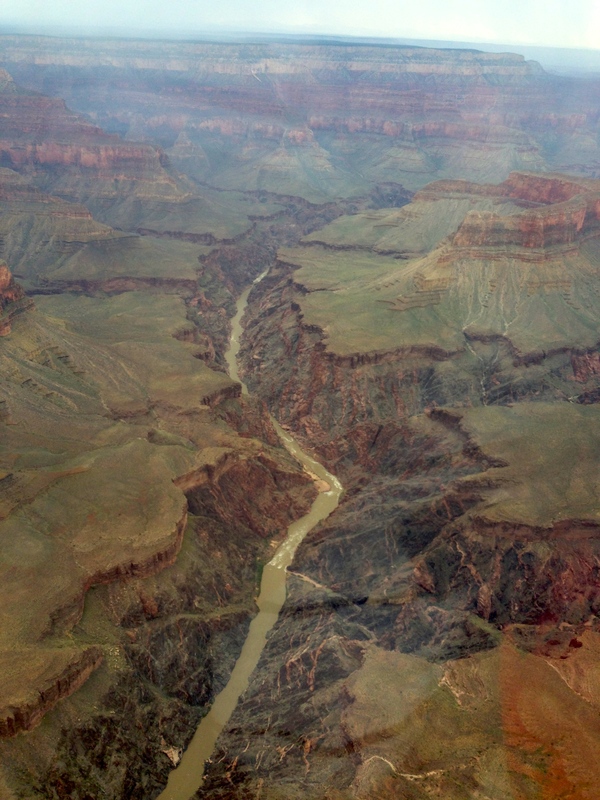 The canyon spreads out as far as the eye can see in both directions, towering peaks vying with impossible vertical drops for our attention, glimpses of the river itself always tantalisingly fleeting. Layer upon layer of reds and browns, mixed with patches of misty rain, make the views even more atmospheric. Tony tells us that although the river looks small, it is around 300 feet (91 metres) wide as it winds through the canyon. At its deepest, its depth is around 85 feet (26 metres). Makes the flotation devices a little more sensible, then. All too soon we are back over the forest and heading back. 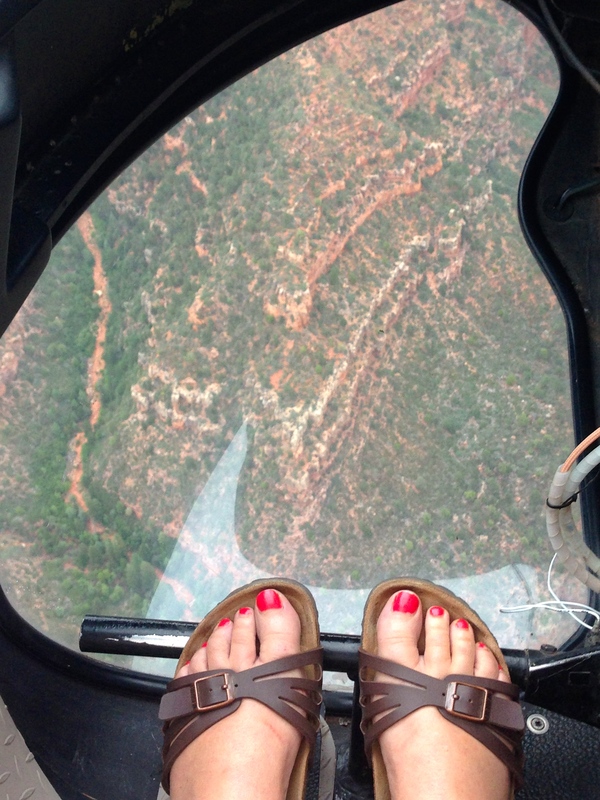 We can still see glimpses of the canyon behind us as we retrace our flight path, hiding below ground level like a divine vision waiting to be fully revealed. I reflect that my Dad always wanted to see the Grand Canyon, and I am grateful to have been able to do the trip on his behalf. Back on the ground, we are picked up and taken to two different viewing points within the national park. After our helicopter ride, we feel able to take our time and take it all in at a much more relaxed pace than our fellow travellers, but I still try in vain to take one or two photos that will go some way to showing the extraordinary beauty of this place. The rain persists but the beauty of the place is not for a moment dimmed. The lodgings in the National Park look like a fantastic place to spend a couple of days. I imagine waking up in the morning and watching the canyon all day as the light ebbs and flows and the colours change from moment to moment. We meet a small family group who have just completed a hike from the rim to the river and back: it’s taken them around nine hours in total. I’m kind of glad we took the lazy option. It’s past eleven at night when we are deposited back on the Strip in Vegas, almost eighteen hours after pick-up. We’ve spent more than half that time in a coach driving through the desert, but we will look back on this day as one of the highlights of our US trip. 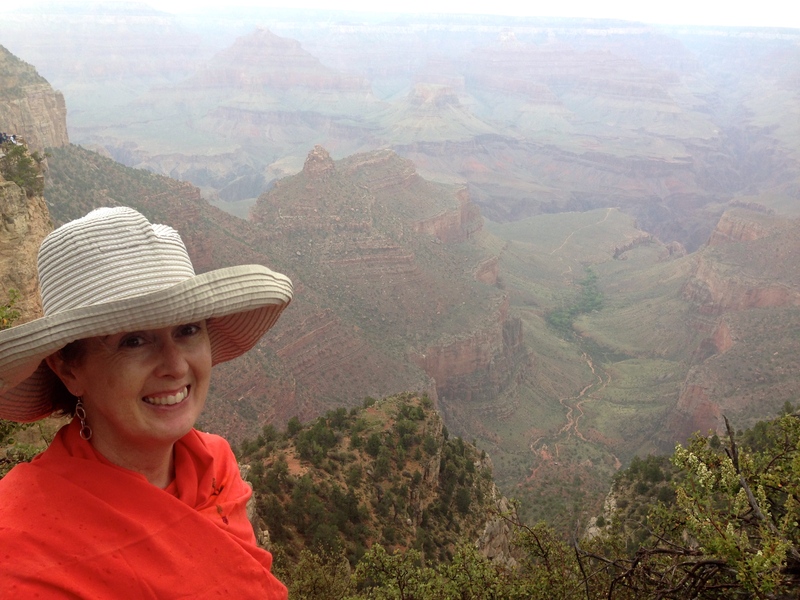 If you can manage a trip to the Grand Canyon, try to spend at least one night at the south rim in the National Park lodgings; if this isn’t possible just bite the bullet and do the long trip to the south rim. This might be the only time you ever get to see this natural wonder, so you might as well see it from the best vantage point.